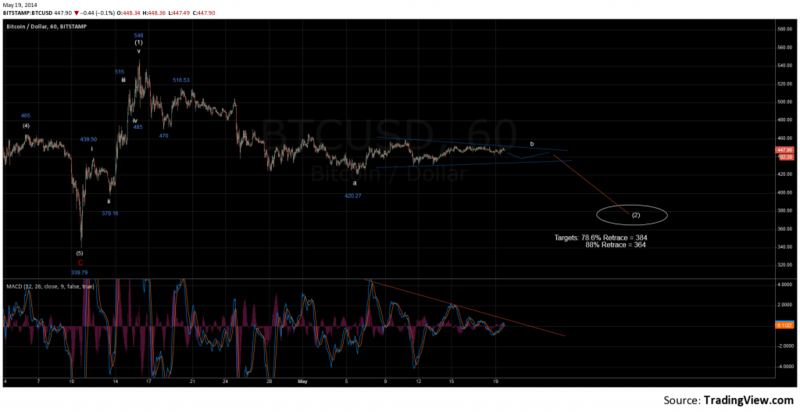 Bitcoin price has been difficult to count and indecisive for the past month. 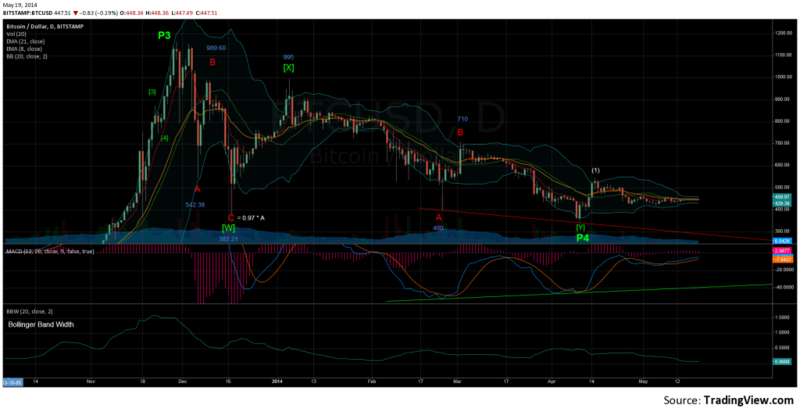 Let’s start this update by taking a look at the daily chart for clues on the current trend. I notice the following important points from the daily chart. Price has failed to stay above the 21 day EMA (listed on top left of the daily chart), which means that the downtrend is still intact. Daily RSI(14) [not shown in the chart] has stayed below the midline of 50, suggesting that the downtrend has not been broken. The Bollinger Band Width, the space between the top and bottom bollinger bands, is extremely small right now. This happens preceding a large directional move, but does not give clues as to which way that move will be. Now let’s look at the hourly Bitcoin chart for a more in-depth wave count. I am counting the price action over the last month as a wave (2) of the primary. Range bound price action over the past 2 weeks suggests that wave b-(2) is playing out as a triangle. Once price drops below the lower trendline of the triangle (dark blue line) BTC price should see a drop below $420 for wave c-(2). The intial target for wave c-(2) is $375, the 78.6% retrace of wave (1). Wave c-(2) must stay above the recent low of 339.79. More realistically, price should not drop below the 88% retrace of wave (1) at $364. The sideways movement from the 420.27 low also shows that (2) is still underway. If a new uptrend was happening then there would have been a more convincing impulse move upwards. My previous update labelled the move off the recent $339 bottom as a major low and the current uptrend as a (1) move off the low. That count is still the primary even though the wave 5-(1) move for a new high above $550 from the April 22nd update was never hit. Should price drop below $339.79, then the count has to be modified. If price rises above $500 then I would move the wave (2) low to $420, but this is an unlikely count considering the lack of an impulsive move upwards in price. Do not forget about the TIGHT BOLLINGER BANDS that are suggesting a large directional move in either direction for Bitcoin price. Wave b-(2) playing out as a zig zag instead of triangle. 62% retrace of (1) at 500 just hit, shouldn’t go above the 78% retrace at 520 if correct.